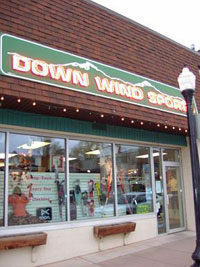 Down Wind Sports opened in 1976 as a way for Dennis and Nancy Henderson to return to their native U.P. and to the Marquette area. Initially, Down Wind sold a great number of Frostline Kits, a pre-cut sewing kit for outdoor clothing and equipment, and the first clothing line that was brought into the store was a little known company at the time called Patagonia. Over the years, the store has been the first to introduce windsurfing, snowboarding and sea kayaking to the Marquette area. In 1982 in search of a larger store the Henderson’s moved the business to its present location at 514 North Third street. In 1998 long time employees Bill Thompson, Todd King, and Jeff Stasser purchased DWS and three years latrer added to the building to house the camping, footwear, clothing and travel departments.